All personnel must wear appropriate personal protective equipment (PPE) to include: hardhat, safety glasses, high visibility clothing, gloves, and work boots when unloading at the tipping floor. All vehicles entering the property must be covered and secured. High visibility clothing must be worn at all times throughout the facility. Equipment operators will designate what area to dump the load on tipping floor. Driver will only be permitted to leave the tractor cab to open/close the tailgate and sweep out the trailer (stay within 6 feet of the vehicle). All personnel must maintain a distance of 15 feet from vehicle or mobile traffic. Transfer station equipment will not assist a vehicle unless they can see driver in the cab. Not wearing appropriate personal protective equipment. Operating equipment in a careless manner. Exceeding speed limits of 5mph on the tipping floors and 10mph on access road. Scavenging of material intended for disposal. Engaging in horseplay or other unprofessional or disruptive conduct. Attendent will direct you to the proper area/location to drop recycling material off. Attendent will also instruct you if it is necessary to return to the scale. Enter the transfer station facility from East 19th street. Check in with scale operator at the window; West end of trailor. Enter Pro Transfer and Recovery Center (PTRC) from East 19th street. 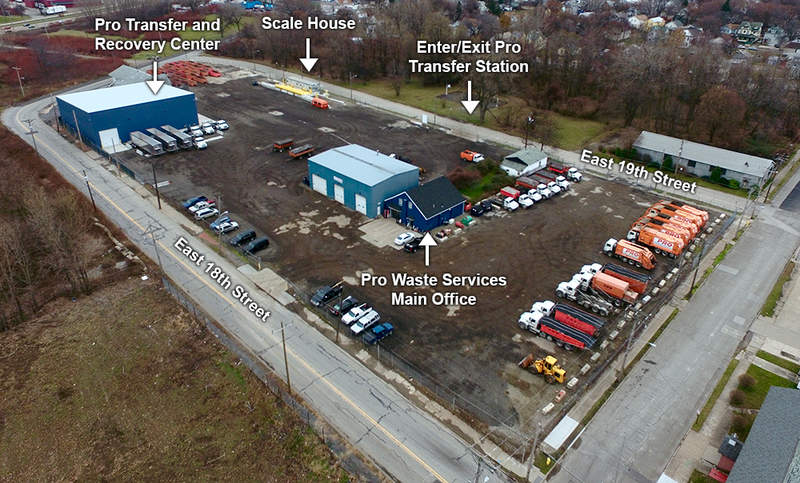 When drop-off is complete, exit on East 19th street. Please empty and clean contents. All bagged material must be in clear bags – no black bags.